We pride ourselves as having some of the fastest shipping times in the industry. Knowing how long it will take to receive your order is very important. Our team knows many of our clients are on time constraints to receive their vanities as soon as possible for their home remodel projects. 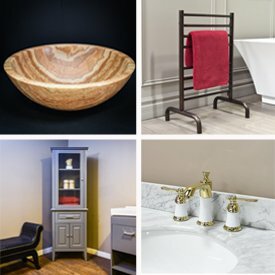 Luxury Living Direct provides free shipping on all orders. In most cases, LTL (Less Than Truckload) freight will be required to ship large items such as bathroom vanities. Return shipments that are not due to defect or damage are to be paid by the customer. We at Luxury Living Direct know that getting your items in a timely manner is important, so we process your order quickly. Orders process either same day an order is placed or within 1-2 days business days. After your order has been processed, shipping takes anywhere from 2 - 7 business days depending on your location. Allow extra time for delivery for remote addresses. ETA varies depending on the driver, weather conditions and vehicle. 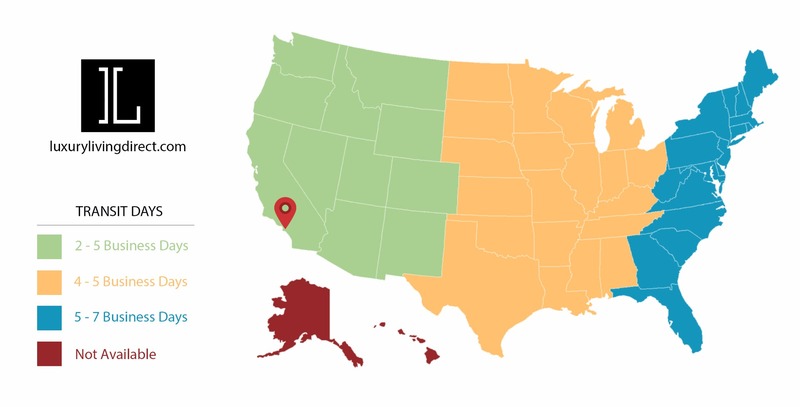 Luxury Living Direct ships only to the 48 states within the continental United States. This excludes Alaska and Hawaii. Currently we do not offer shipping outside the continental United States. We do not ship to a PO Box address. The above transit times apply only for items shipped by freight. Times shown are estimates. Once your order leaves our warehouse, a tracking number along with receiving instructions will be emailed to you. Please 24-48 hours for tracking codes to activate. Once your shipment arrives at it's terminal destination the freight company will call you to schedule a time for delivery. Large items such as bathroom vanities are delivered to you curbside only. Requests cannot be made for delivery inside your home. Please follow the receiving instructions to ensure that your product has arrived without damage. At the time of delivery, please request an inspection of the product(s). If the driver allows you inspection, please notate ANY damages found on the delivery receipt. If the driver would not allow you to perform inspection; you MUST take picture(s) of the package BEFORE you open it and notate the condition the package is in such as; “CREASED MARK”, “CRUSHED CORNER”, “TEARS”, ETC.. If a product(s) appears significantly damaged upon delivery, refuse the damaged item. Take pictures of the damage, if possible. ALL DAMAGE MUST BE REPORTED WITHIN 1 - 2 BUSINESS DAYS. Failure to follow the instructions above will result in a charge for replacing the item. What if I am not there to accept my delivery or if I am out of town? If you cannot be there to accept the product(s), someone on your behalf may accept the package. However, you are still subject to our Terms and Agreements. The carrier will not ship the product(s) until you provide them with a delivery date and time. If no one is there during the arrival of your product(s), you will be subject to a redelivery fee if you wish to have it delivered again. When placing an order(s), please provide us with your best contact phone number and email. The carrier will contact you so that they can schedule an appointment for delivery. If we cannot contact you to set up a delivery appointment, you are then subject to storage fee. We will ship the product(s) to the shipping address you provide when you initially place the order. If you wish to change the shipping address during transit, you are subject to a reconsignment fee (change of address during transit). Regardless of the distance from the original shipping address, a reconsignment fee will apply. I need help moving the product(s) from the curb to my house. Would I be able to get help from the driver? Unfortunately our free shipping only applies to curbside delivery. The carrier is only obligated to deliver your product(s) to the curb. The product(s) will likely arrive in numerous boxes, so it is recommended that you have a few people on hand to assist you when the product(s) arrive. The carrier does offer assistance if you wish to have to it deliver inside the property, however you are then subject to inside delivery fee and it is required that you contact us before requesting it. How long does it take to have it delivered to me? The transit time can be anywhere between 2 – 7 business days. Unfortunately there is no way for us to know exactly when you will receive your product(s) once it leaves the warehouse. Depending on the driver, the weather conditions and the vehicle, the ETA for your product(s) will varies. We will provide you with tracking confirmation and from that confirmation; you will be able to view the location of your product(s). The window for delivery is 10am to 5pm on the delivery date specified by the carrier. What if my product(s) arrives damaged? If you follow our receiving instructions, you are entitled to a replacement, refund or compensation to keep the vanity as-is. To report damage, please e-mail us with your order number and any photos you have taken of the damges.